Unlike previous Gauntlet iterations the gold actually means something! Although the collection of gold slower than I would have liked, it goes towards a good cause. The shopkeeper in the hub chamber will sell you artifacts. 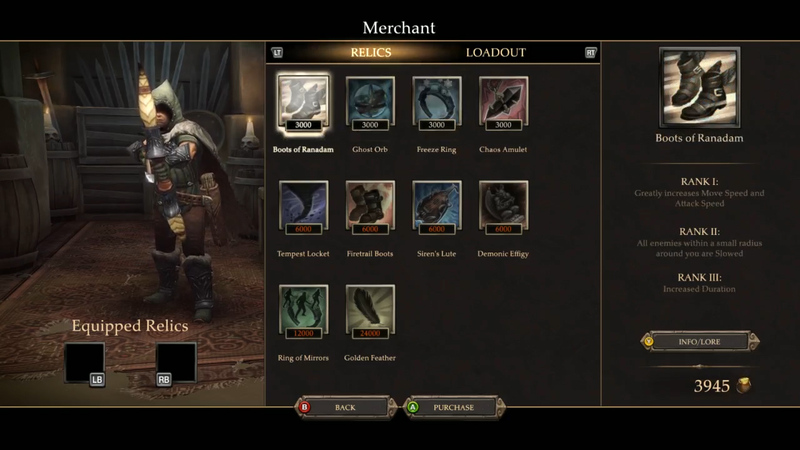 When equipped to an item slot on a character these artifacts allow the user to wield tremendous power. Okay, they are not that tremendous but they do allow for some customization and aid when things get hairy within the dungeon. The artifacts are fueled by the potions collected throughout the levels and grant the user effects as simple as freezing enemies all the way to creating illusions of a hero. My personal favorite is the lute, which temporarily turns the player into a bard for several seconds while pacifying monsters for the duration. 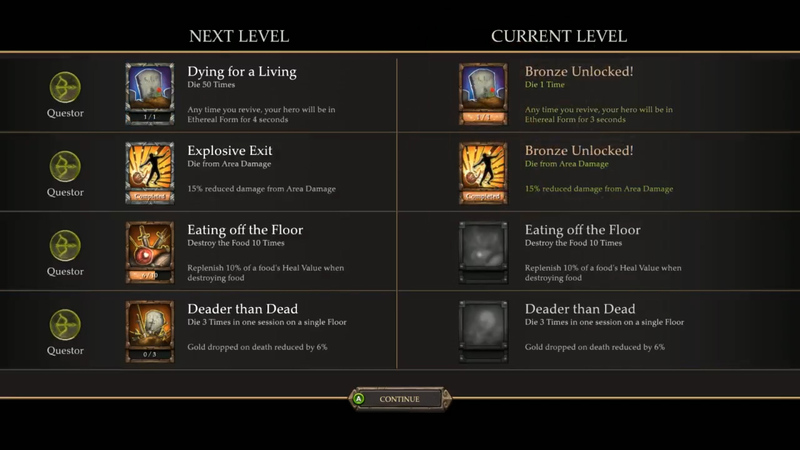 Artifacts can be upgraded an additional two levels using gold, granting them added bonuses and effects. With each hero able to equip two artifacts at a time this results in some interesting combinations of skills between a party. It isn’t at the loot level of Diablo or Torchlight, but it is a welcome addition to the Gauntlet formula. The first time through on normal is going to be demanding, even with a full party of competent allies. Normal mobs can quickly take you down with several hits, and from there the enemies only get worse. Special mobs come with magic, equipment, and their own set of tricks to try and stop the team in their tracks. Teamwork is essential and as I mentioned before, playing alone becomes tedious, unless you’re into the whole ‘solo wizard on insane mode’ thing. 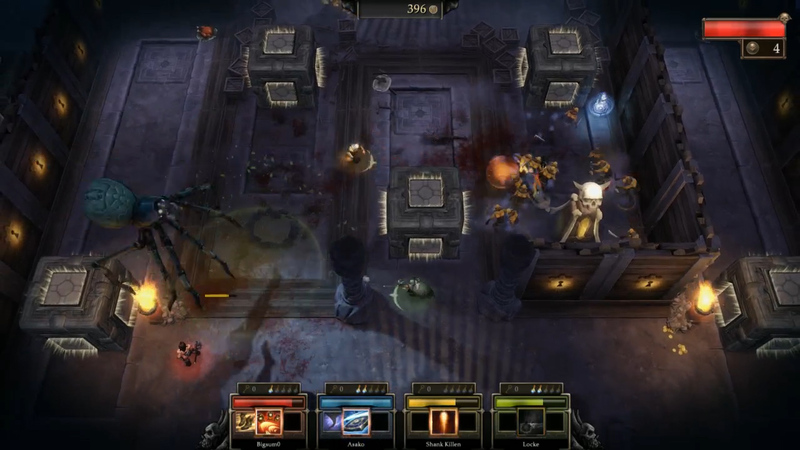 Traps, elite enemies, and mini bosses are littered in the dungeons which keep Gauntlet true to its treacherous roots. At least you don’t have to feed this one quarters every time you die. A key component to the co-op is the fact that lives are shared across the party, balancing the disparity between player skill. Gauntlet has never been easy and it has not changed here, so gird up your loins, grab some friends and get to the dungeon. Repetition is a common theme throughout Gauntlet and thankfully the old school train of thought has not been completely wiped out in this version of the game. It retains the core gameplay of a Gauntlet game and small refinements have updated this series to fit in this generation. It is awesome to see enough of the old style bleeding throughout, but careful considerations have shaped Gauntlet into a worthy successor of the title. It doesn’t hold a ton of content, but it sure is fun with a group of friends to hack and slash your way through a modernized classic. The Co-Op Experience: Gauntlet� is back! The original role-playing arcade game lets four adventurers explore together as a warrior, valkyrie, wizard, and elf. Traverse the darkest of mazes, destroying vile beasts and claiming gold. Consume food to regain your strength, collect keys to journey deeper, and seek out potions to defeat your most powerful foes. One to four players play together on Xbox Live� multiplayer game mode.